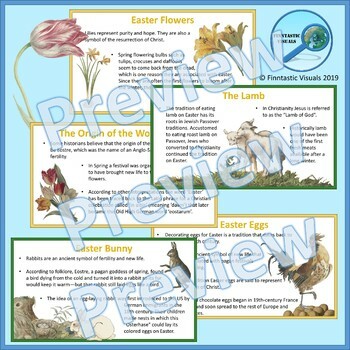 This free download by Finntastic Visuals features a Power Point presentation and a set of five 'fact cards' about the origin of different Easter symbols and traditions (the word Easter, Easter Bunny, Easter Eggs, Easter Lamb and Easter Flowers). The power point presentation is in a standard 13.33" x 7.5" wide screen format. 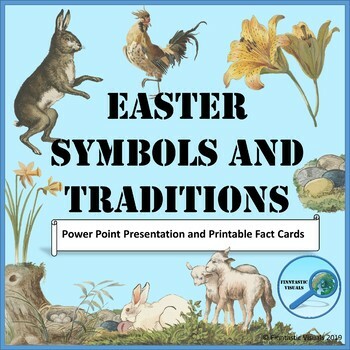 Each slide contains one Easter fact card as a jpg. image that can be resized, removed or printed. 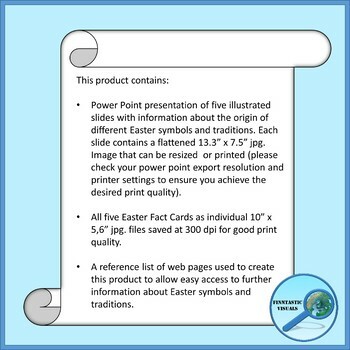 If you'd like to print higher resolution versions of the fact cards and use them for example as a part of an Easter display in your classroom, the cards are also included as individual 10" x 5.6" (300 dpi) jpg. files that can be resized to fit your needs. All cards are illustrated with color images created by modifying and remixing details from public domain fine art. The cards have a white background for economical printing. As a new seller I welcome all comments and feedback to help me develop and improve the quality of my products! This product is meant for personal use or to be used by one teacher in a single classroom. You may not share, sell or redistribute this product or part of it in any form.